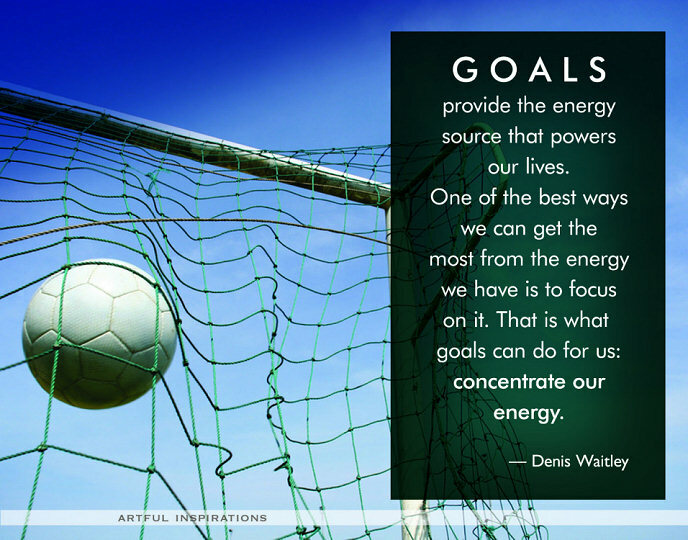 Using Goals to Focus Your Energy | Choose Your Energy: Change Your Life! Today we’re going to talk about the roles of potential and kinetic energy in setting and achieving our life goals. Potential energy is energy that has yet to be activated. It is present everywhere and in everything, a reservoir of opportunity filled with endless possibilities. Kinetic energy is energy in action. A person walking down the street or a car moving down the road. We transform potential energy into kinetic energy when we take action. Our goals and plans help us focus our energy by taking action to manifest our desires. They help us transform the potential energy of unexplored possibilities into fulfilling realities by harnessing kinetic energy. Speak your goals out loud and write them down. By giving your goals shape and form, they become clearer and more concrete. If you consider yourself more of a talker than a writer, I find a two step process of speaking them aloud and then writing them down works great. (Dictation software like Dragon Naturally Speaking from Nuance can be a great aid.) If you’re more of a writer than a talker, reverse the order: write them down and read them aloud. Don’t stress over the perfect words. Start with a few words or a simple outline and allow yourself to reflect on it and and refine it over time. Once you start putting it on paper, your dream takes a giant step closer to becoming a reality. Trust me, it’s how I wrote a 266-page book. As renowned inspirational author and speaker Mike Dooley reminds us, “Thoughts are things—choose yours wisely.” Pay attention to the language you use to articulate your goals. Starting with such words as “I wish, I need, I want” positions you in a place of neediness and lack. Coming from a place of victimhood doesn’t provide you a firm foundation for the discernment, commitment, confidence and persistence it will take to manifest your dreams. Framing your goals in the language of “I choose, I have, I am” puts the power right where it belongs—in your hands. Specific: What’s the first baby step to move you in the direction of your goal? What will you do, how much of it and how often? Which foods, what types of exercise, how many ounces, calories and minutes? Measurable: For your initial baby step, how will you know you have succeeded? What will the quality or quantity of success look like? Inches or pounds lost, quality of calories consumed, minutes walking a certain distance. For what you have listed in the “specific” category, how have you qualified and quantified the measures of success? Aligned: Is your initial baby step and overall goal aligned with your core values? I find this one to be the hidden saboteur. Not just the values you admit to. For example, if you come from a family of chronically obese or out-of-shape people and one of your family values is that you always stick together, you might mistakenly conclude that getting fit would run contrary to that value. If you swear you want to accomplish something but you keep missing the mark, get curious. Ask yourself, “How might achieving this objective be out of alignment with a hidden value?” Then focus on the fear-based lies and illusions concealed in that value and set about transforming them and boosting your motivation by fueling it with a new love-based truth and reality. Realistic: Is this initial step really a no-excuses baby step? If you are a member of the club that always sets the bar inhumanely high, you may have a habit of sabotaging yourself right out of the gate. Make sure your goal is indeed a no-excuses baby step that is completely doable at this time in your life. Time-Frame Anchored: Make sure your specifics include exactly when you will complete your initial no-excuses baby step. For example, upon arising and before walking, you will consume a 250 calorie breakfast consisting of a sixteen-ounce glass of water with lemon, one hardboiled egg, one ounce of string cheese, a slice of dry whole wheat toast and a cup of black decaf coffee sweetened with stevia. Five minutes of walking every morning after breakfast and before you shower. Once this healthier way of living becomes a habit, you may find you can trust yourself to be more flexible about the timing. In the beginning, giving yourself structure helps support your success. Helping those who have difficulty holding themselves accountable to learn to do so with love and respect by creating a reasonable plan based on a series of achievable baby steps that will allow them to flow into completion. Helping those who’ve been accountable for everyone and everything since birth learn to eliminate much of what is on their list and, with love and respect, replace it with a reasonable plan based on a series of achievable baby steps that includes rest, reflection, and play at the top of the list. We can give nothing of lasting value from an empty well. If you are in the latter group, then—having encouraged you to come up with a SMART plan for reaching your goals—I remind you that spontaneity is essential to a life of vitality. Hold your plan loosely by remaining open to additional input from the Universe and flexible in your approach. While having a plan can be powerful, when we are too wedded to just one way of manifesting our desires, our plans become impediments rather than enablers. How can setting a series of minimal goals possibly deliver results? Because substantial, sustainable improvement of any sort is usually grounded in incremental improvement, not rapid leaps and bounds. Celebrate every step forward, no matter how small. If you exceed your no-excuses goal, that will result in even greater celebration. Force and extreme deprivation are not necessary. Excessive goals result in disenchantment, illness, injury and burnout. Easy goals lead to easy success that fuels lasting motivation for a lifetime of even greater success. And, when you miss the mark or fall off the wagon, absolutely no beatings or self-berating. It will not help you do better in the future. It will demoralize you into giving up for all time. Embracing constructive core energy grounded in love, respect, curiosity, compassion and gratitude will always help you reveal and advance the highest good by fostering a life of generous, effortless, gracious flow filled with faith, hope, prosperity, peace and joy. What’s YOUR NEXT JOYFUL BABY STEP for harnessing and directing the potential energy of opportunities in your life TODAY? This entry was posted in All My Blog Posts, Creativity & Self-Expression, Stress, Perfectionism & Burnout and tagged Deborah Jane Wells, How to de-stress, How to stress less, What is burnout, What is creativity, What is perfectionism, What is stress, What is stress management. Bookmark the permalink.